Materials: 1 container with your personal belongings, preferably a tote bag or backpack. Directions: Stand anywhere within a room containing a group of pals who are all partaking in some sort of social engagement. In this case, you are most likely in a classroom setting. Personal container handy, with both hands, turn the bag completely upside down allowing the contents to fall into the floor. Leave for the duration of the meeting. **Use your best judgement. Remove valuable cumbersome objects such as a personal computer prior to the dump. The Ronald McDonald Bench Statue is Missing, 2018. Materials: Assorted photographs of beloved Ronald McDonald. Tape. Glue. Scissors. Staple Gun. Megaphone. Writing utensils. Missing poster templates. Directions: Ronald McDonald is missing! 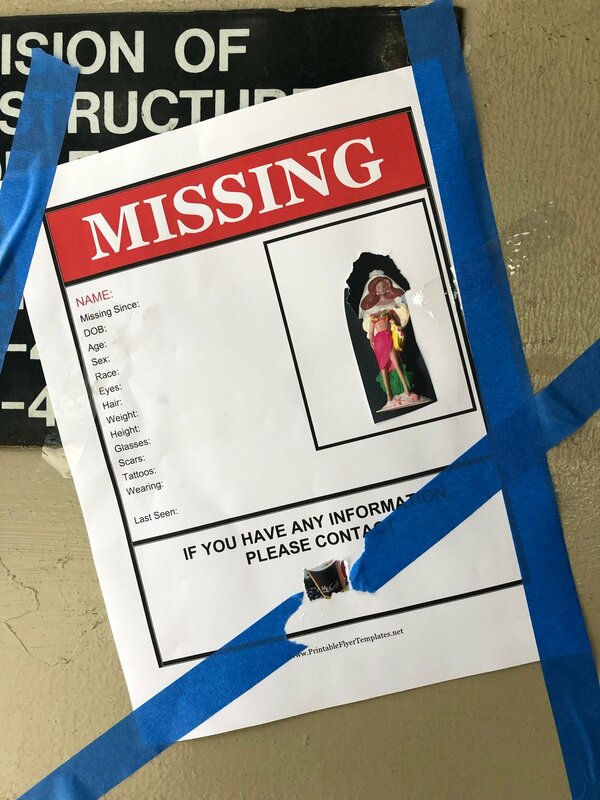 Make missing posters for him and display them around the neighborhood. Columbia university has bought McDonald’s property and plans to turn this neighborhood corner diner into a private hotel. And the statue is actually missing. Artists: Nicole Burko, Tyler Coburn, Travis Fairclough, Annette Hur, Noah Jackson, Susanna Koetter, Sarah Lee, Cara Lynch, Erica Mao, James Mercer, and myself.